Archaeologist Dr Ken Dark, in the Bulletin of the Anglo-Israel Archaeological Society [BAIAS] (Vol. 26, 2008), wrote a 5 page review of René Salm’s The Myth of Nazareth: the Invented Town of Jesus (2008). I was led to this review after catching up with a discussion of Salm’s book on the Freethought & Rationalism Discussion Board. Salm then argues that this, in turn, discredits the New Testament account of the childhood of Jesus Christ, an argument that must have made the book attractive to its publisher, the ‘American Atheist Press’. So it looks like the battle lines are drawn: an archaeological project funded by “Holy Land” and “Christianity” interests and aimed at promoting a 3-D time capsule for lay visitors versus a publisher with a vested interest in discrediting the same faith. René Salm’s published response to this Final Report of the Nazareth Village Farm surveys and excavations provoked significant reactions in the same BAIAS, among them a 22 page “Amendment” to the original Final Report. Clearly it would be a mistake to dismiss the amateur Salm as a fringe crank. His responses in the academic discussion list, Crosstalk2, some years ago also introduced him as someone whose knowledge and understanding of the archaeological reports deserve serious attention and responses. This review will not draw attention to . . . . language . . . , although it is worth noting that Salm affords no equivalent courtesy to other scholars (for example, criticizing Bagatti’s English grammar on p.113). We note, first of all, the incorrect English grammar. The subject is plural and two examples are given, but the verb is singular. It is of no moment whether the faulty grammar is due to the author or to the translator, for — since Bagatti nowhere claims Hellenistic structural remains — we here have the remarkable admission that the entire Hellenistic period at Nazareth is represented by only two pieces: an oil lamp nozzle, and number “2 of Fig. 235.” . . . . . A third surprise meets us when we compare the two artefacts. Incredibly, they are two versions of one and the same piece — represented once in a photo (Fig. 233 #26), and once again in a sketch (Fig. 235 #2). This may explain the singular verb is in Bagatti’s statement: the two pieces are one. Ken Dark’s complaint that Salm is less than gentlemanly for stooping to correcting Bagatti’s grammar is a disingenuous avoidance — even a misrepresentation — of Salm’s discussion of the nature of the evidence and how it is misleadingly reported. Besides his writings on Sepphoris, Strange has authored scores of archaeological reference articles on many sites in Palestine . . . . He has published extensively on Nazareth . . . . Other than Bagatti, Strange is arguably the most cited scholar on Nazareth. This is curious for two reasons: (a) unlike Bagatti, Strange received no academic degree in the field of archaeology . . . . and (b) Strange himself has never dug at Nazareth, nor has he authored a report dealing with material remains from the Nazareth basin. Though very influential, Strange’s contributions to the scholarly Nazareth literature are limited to brief summaries of the site’s archaeology and history in reference articles and books. He is not in a position to offer us any new material evidence, and thus his opinions lie entirely within the range of the secondary Nazareth literature. Nevertheless, his views have radically departed from those of Bagatti and the Church, and have moulded the prevailing attitude in non-Catholic circles regarding Nazareth. . . . . . . Dark suppresses the fact that René Salm is challenging Strange, and the surprisingly widespread influence of Strange’s interpretations, on grounds that his views stand in contradiction to the “material evidence” reported by the “principal archaeologist at Nazareth”. Such is the disingenuity with which Ken Dark begins his review. So by way of introduction, Dark misrepresents Salm for supposedly focussing on Bagatti’s grammar and supposedly complaining of Strange’s inability to offer new material evidence. As the quotations from Salm, above, demonstrate, Salm is actually addressing the lack of forthrightness with which the actual evidence is reported (not grammar per se, contra Dark), and the widespread acceptance of opinion and interpretation in place of material evidence as reported by “the principal archaeologist” (not Strange’s reliance on secondary literature per se, contra Dark). 1. Is it logically possible to show Nazareth did not exist at the time of Jesus? Dark is quite correct logically when he elaborates the above by pointing out that hypothetically archaeologists could all be digging at the wrong places entirely for the New Testament Nazareth. It matters not how weak (or strong) the archaeological evidence is, one can always hypothesize that it is in the wrong place. True, true. So let’s not be so Bernard Woolley-like pedantic and instead let’s limit our discussion to the evidence at sites as they are published as supports of the New Testament Nazareth. Which, of course, is what we are all doing. Dark faults Salm for apparently addressing only a single natural water source (St Mary’s Well) in his description of the area. Others to which Dark alludes apparently date from the fourth century and later Byzantine times (according to Dark’s footnote). Fair enough. Will keep this in mind when I have another look at Salm’s book. The point does not swing the argument either way over the existence of Nazareth in the early first century c.e., however. Structures on terraces and rock-cut hill-slope structures — recently discussed as a type of construction by Richardson — have been published from excavated Roman period Jewish settlements elsewhere in the Galilee . . . . Richardson’s book  . . . might also have appeared too late for inclusion [in Salm’s bibliography]. The hillslopes in question are, according to Salm’s description, and not denied by Dark, “rocky, steep, and cavernous” and dotted with tombs, although the tombs apparently do not date prior to 50 c.e. Against this, conformity to Luke’s account of the attempt to push Jesus off a cliff means that a settlement must be found in the adjacent hillsides. Ken Dark’s critique would have had more punch had he addressed this point of Salm’s (the prima facie unlikeliness of a hillslope settlement in this particular place), and even moreso had he pointed to evidence for a pre-Christian settlement among the hillsides in question. Certainly the fact that the hillside tombs date from the latter part of the first century c.e. does not preclude the possibility of an earlier settlement beneath them. The evidence is still to be uncovered. the dating of these would have been more credible if he employed the dated typology in the now-standard work on Second Temple burial, Rachel Hachlili’s excellent 2005 book Jewish Funerary Customs, Practices and Rites in the Second Temple Period. This renders his chronology for tomb construction invalid, as it is based on interim, popular or outdated works, and leads him to ignore typological evidence for Hachlili’s Type 1 Second Temple period tombs in Nazareth. Is it an over-reaction to see this criticism (failure to refer to a 2005 publication) as a little breathtaking when only a page earlier Dark had observed that a 2004 publication was probably too early to be referenced in Salm’s book? Are all scholarly reported dates prior to 2005 really rendered “invalid” by this 2005 publication? Dark’s critique would, of course, be even more pertinent were it addressing evidence for village life, not death and burials. Dark’s point that later tombs do not logically deny the possibility of evidence for village life existing below them in earlier strata is valid, nonetheless. Presumably, then, the implication is that the village Jesus knew would have been overlaid and/or dug up and used for tombs within some decades of the life of Jesus — although this implication is not explicitly raised, naturally enough. 4. Site of the Church of the Annunciation on tombs? The suggestion [by Salm] that there were Roman period tombs . . . on the site of the present Church of the Annunciation is interesting, but the evidence is inconclusive. Dark critiques aspects of Salm’s arguments for the church being built on what was primarily a tomb site, and that these preceded the agricultural activity at the site. This is a point I’m prepared to continue to watch as others more knowledgeable debate. I am not clear on the centrality of this point, however, to the core of Salm’s case. Salm points to what he considers a lack of certain Late Hellenistic pottery from Nazareth . . . Before one can establish its absence from the record (and that is not, of course, the same as absence from the settlement) then one must set out what would, identifiably, constitute the presence of Late Hellenistic ceramics there. What Dark means here is that sometimes a Jewish community chose not to use ceramics of a non-Jewish provenance. These communities, therefore, eschewed the very wares, for example Eastern Terra Sigillata (‘ETS’), that may be most precisely dated or are most widely distributed elsewhere, such as Galilean Coarse Ware. This is interesting, but Dark still frustratingly fails to address Salm’s key point here, the absence of evidence. Few twenty-first-century archaeologists would credit Salm’s assertion that ‘two- and three-inch fragments of pottery vessels are a precarious basis indeed for fixing the type and date of an artefact’ (p.125). Because there is a non-correspondence between the diagrams and the descriptions [or Bagatti], however, we are in an impossible position. Dark sidesteps the problem Salm is raising and that arises because the pottery shards are so fragmentary and few, and that they do not correspond to their verbal descriptions by Bagatti. How can we determine their real nature from such contradictory and scanty evidence alone? I would have had more confidence in Dark’s portrayal of Salm as an ill-informed and illogical crank had he addressed in his review the core of Salm’s arguments. I recommend reading Salm’s book with Dark’s review in hand for corrections and evaluations of various claims in The Myth of Nazareth, and to assess how at least one professional archaeologist responds to (or avoids) its central case. I originally read René Salm’s dialogue with scholars, including archaeologists, on Crosstalk2 and nothing in Ken Dark’s review has persuaded me to dismiss out of hand Salm’s critiques of Nazareth archaeology. I remain open to all and any scholarly reports and discussions about the archaeological study of Nazareth. One summary of one set of these discussions is still available at message 13031. As for the relevance of the study, I cannot go so far as to see the existence or non-existence of Nazareth in the early first century c.e. being central to “the survival of Christianity”. Astronomical and biological sciences have not undermined the faith. Archaeology won’t either. But if it can be established that Nazareth was not settled as a village until after the fall of Jerusalem, then there would be implications for dating the gospels. When Jesus went out with a loud voice . . . . This lends itself to neat bit of eisegesis that Jesus’ shout from the cross was a cry of judgment and/or victory. Probably the most obvious noncanonical text with this particular paradox to come to mind is “The Thunder, Perfect Mind” where the Saviour proclaims he/she is both silence and manifold voice and one who cries out (thunder?). I can’t help but wonder so many of the narrative paradoxes we find in the Gospel of Mark also being found epigrams in some gnostic-type literature such as The Thunder, Perfect Mind. One example of this approach is to take two passages from Mark and Luke using them to create a third unlike any found in either Mark or Luke. I have just completed reading one of those books that I picked up almost on a whim at a bookstore, but one where the author tricked me into thinking I was about to read about the significance of the discovery of one particular fossil, but before half way through he had enticed me to explore ever deeper understandings of the unity of all life on our planet. It’s a brilliant book, a must read, I would like to think, for anyone interested in an understanding of how and why humans are the way they are, and how our essential makeup can be studied across all other species, both today and past, back to the earliest multi-celled bodies. Your Inner Fish, by Neil Shubin, deserves every one of the cover blurb accolades from the Financial Times, Guardian, New Scientist, Nature, Sunday Times and Sunday Telegraph (the one used in this posts header). I remember when the discovery of Tiktaalik first hit the news headlines, and have always been amused by the similarity of the name with an Australian aboriginal Dream Time frog, Tiddalik, who swallowed up all the water leaving others animals endangered until they figured out a way to trick the frog into releasing it all again. 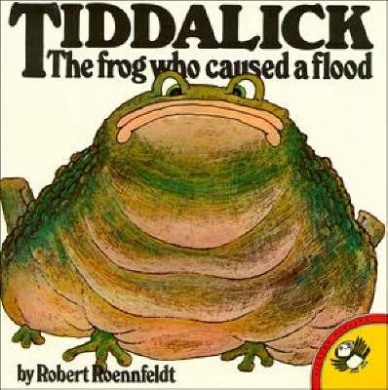 Many non-aboriginal Australian school children also know the story of Tiddalik from a number of children’s picture books that have been published about him in recent decades. One piece of information depressed me somewhat. It was when Shubin was explaining the origin of first multicellular bodies. The means within cells that enabled them to unite to become multicellular had been there for millions of years before they actually did, but since multicellular bodies need much more energy, via oxygen, to survive, they had to wait till the earth’s atmosphere became much richer in oxygen to enable that development. But what was the catalyst that prompted the first multicellular bodies — and the beginnings of all multicelled life, and us? It was most plausibly the fact of predation, the contest between eating and being eaten. A larger multicelled body had a better chance of defence against being eaten, and then it also had a better chance of successfully consuming others. So the fact of multicelled life forms is a depressing result of the savage violence of nature. I suppose at some level I probably sort of knew something like this before reading Shubin’s book, but the concepts were crystalized and took on deeper meaning as a result of reading about the big picture of all life. Another image that will stick with me was the way evolution works, and how we are really all in some distant sense modifications and mutations of each other. Take a very malleable fish and imagine twisting and stretching and pulling it into a new shape to be like a reptile or bird or mammal. (Not as completely bizarre as it might at first sound, since the same micro level processes and agents within skin that produce scales also are capable, with chemical different stimuli, of producing hair and feathers.) We might, if skilful and patient enough, be able to make the “fish” shape look like another species, but there will be trade-offs. What was a very efficient direct nerve line from the base of a skull to the breathing apparatus of the gills will become a convoluted and bizarre extended route for a nerve from the same starting point, the base of the skull, to the areas of the lungs way on the other side of the body and way further down from the skull base. Other processes will almost inevitably interfere with this most inefficient nerve route from time to time, and as a result we will get hiccups. The beauty of the book is the way it demonstrates how all life forms share a common ancestry, that we are all related. And how understanding the DNA of life forms — and comparing it across species — enables us to understand the causes of certain diseases and deformities. I have more confidence that evolutionary science will bring us more hope for a healthier life span than faith in deities. Not only does it demonstrate how we are all related, but how the evidence also demonstrates (as evolutionary theory predicts) how we can trace our family lineages back through time in the rocks. The picture of all life forms having one ancestor, and thus being all related, and seeing the ways in which our body parts and functions are directly a part of the whole of all living creatures, across species and back through time, is a powerful one. There is real design in all living creatures. But it is not a perfect design. It is a remarkable and humbling design that demonstrates our shared ancestry. Some redesigned bits work well in new environments, but with tradeoffs, particularly susceptibility to certain diseases. Diseases and body vulnerabilities are not a punishment for sin, they are a tradeoff for evolutionary adaptations. Our skeletal structure was not originally meant for a creature to walk on two legs. Bad backs and easily twisted knees and ankles are something fish never experience, and we have inherited their skeletal structure twisted and extended to meet the requirements of our environment. Not that the book is really about fish. As the author says, he could have just as easily have titled it, “Your inner fly” or “Your inner rodent” or “Your inner frog”. It would still be essentially the same book. I did feel a little queazy, though, when I read of experiments that led to so much of this understanding of how evolution works. Deliberately testing genetic transplants across species to make two headed flies or flies with a leg where an eye should be. Did evolutionary scientists once, as children, while away bored moments by catching and pulling legs out of flies? It was when I left religion and found a new wonder and humility and poetry realizing I was a part of all life that gave me a new kind of respect for all other life forms. Writing his commentary on Matthew around the 220’s, and in reference to James, Origen gives us our first extant reference to the phrase, “the brother of Jesus who is called Christ”. In later years he repeated it twice in his Contra Celsum. (See previous post for the translated extracts.) In each of these three passages Origen claims that Josephus tells us that the fall of Jerusalem was punishment for a Jewish mob murdering the Just James, the brother of Jesus called Christ. Josephus, on the other hand, in Book 20, says nothing more than that James, with some companions, was unjustly executed by the high priest through an illegal calling of judges; the point of J’s story is to describe reasons for the fall and replacement of a wicked high priest, and there is no linkage to the destruction of Jerusalem. Question 1: Origen said that the passage was in the writings of Josephus, but where in Josephus? It is not there in our copies. In the Josephan passage the villain is the high priest and the general public are so outraged by his actions (not only against James but also against his companions) that they initiate actions that force his removal and replacement by another (Jesus the son of Damneus); yet in Origen’s story of James the Just being martyred, the Jews fully support and participate in the murder of James. also Origen’s story of a Christian James does not make sense in the Josephan passage — why would murdering a despised Christian outrage the Jewish nation? and Origen’s James is also renowned for his scrupulous adherence to the law, so on what grounds would Ananias have had him murdered as a law-breaker? 3. The manner of James’ death has been already indicated by the above-quoted words of Clement, who records that he was thrown from the pinnacle of the temple, and was beaten to death with a club. But Hegesippus, who lived immediately after the apostles, gives the most accurate account in the fifth book of his Memoirs. He writes as follows . . . .
Eusebius indicates here that the story of James’ death that we read in Origen was [also? really?] found in the 5th book of Memoirs by Hegesippus. Again, Josephus is named as a source, but again, there is no indication of where in Josephus this account is to be found. It is possible that Eusebius was attempting here to add weight to the story by his reference to what he had read in Origen. It seems he was not referring to Josephus himself here, since he seems as ignorant as Origen re where Josephus wrote this. 21. And the same writer records his death also in the twentieth book of his Antiquities in the following words: But the emperor, when he learned of the death of Festus, sent Albinus to be procurator of Judea. But the younger Ananus, who, as we have already said, had obtained the high priesthood, was of an exceedingly bold and reckless disposition. He belonged, moreover, to the sect of the Sadducees, who are the most cruel of all the Jews in the execution of judgment, as we have already shown. 22. Ananus, therefore, being of this character, and supposing that he had a favorable opportunity on account of the fact that Festus was dead, and Albinus was still on the way, called together the Sanhedrin, and brought before them the brother of Jesus, the so-called Christ, James by name, together with some others, and accused them of violating the law, and condemned them to be stoned. The pre-Eusebian silence on the James passage which refers to “Jesus called Christ” is not as strange as the silence regarding the fuller reference to Jesus in Book 18 (the Testimonium Flavianum), as I think Doherty remarks, but it does remain a question to be answered nonetheless. What we do find are pre-Eusebian references to a very similar phrase, only found in a more natural word order, in connection with a story of the death of James (the Lord’s brother) that is by Origen attributed to Josephus and by Eusebius attributed to Hegesippus. (We also have Jerome’s even later testimony, but that is another story altogether. See Doherty’s discussion for an intro.) That story is not in our copies of Josephus, and we are not told by ancients where in Josephus it should be found. But we are given a detailed title and chapter/book number for a reference to the same story by Hegesippus, an author with a similar sounding name to Josephus. the brother of Jesus called Christ, James by name . . . . In my previous post I outlined the reasons why Josephus would have been unlikely to have attempted to remind readers who Jesus was by such a phrase. And if Jesus was not identified by “called Christ” in this passage in Josephus, he would most logically be the same Jesus who, after the execution of James, was made the new high priest. 22. Ananus, therefore, being of this character, and supposing that he had a favorable opportunity on account of the fact that Festus was dead, and Albinus was still on the way, called together the Sanhedrin, and brought before them the brother of Jesus, , James by name, together with some others, and accused them of violating the law, and condemned them to be stoned. 23. But those in the city who seemed most moderate and skilled in the law were very angry at this, and sent secretly to the king, requesting him to order Ananus to cease such proceedings. For he had not done right even this first time. And certain of them also went to meet Albinus, who was journeying from Alexandria, and reminded him that it was not lawful for Ananus to summon the Sanhedrin without his knowledge. 24. And Albinus, being persuaded by their representations, wrote in anger to Ananus, threatening him with punishment. And the king, Agrippa, in consequence, deprived him of the high priesthood, which he had held three months, and appointed Jesus, the son of Damnæus. Eusebius, it appears, knew nothing more than the above passage (the quotation is from his Church History), and in his desire to make the extant copies of Josephus really say something about the death of the Christian leader and brother of Jesus Christ, inserted the phrase, called Christ, after Jesus. Without the phrase “called Christ” the passage (even its strange word-order placing the reference to Jesus first before his brother James) makes perfect sense, consistent with Josephan style elsewhere, of the background machinations to the murder of James; it was his brother, Jesus, who was ironically (and/or via some longstanding power game) who was made the new high priest. James was the “bit player” in the drama (a certain James by name — no need for further elaboration it seems), the unfortunate target that led to the fall of Ananus and his replacement by his brother, Jesus. But this was not the Jesus called Christ, but one of 20 other Jesus’s in Josephus. The Greek phrase for “called Christ” —tou legomenou Christou — furthermore, ‘just happens’ to be used in the canonical gospels of Jesus, in particular that most popular of all gospels in the second century, Matthew, and in Justin Martyr’s writings. And Jacob begot Joseph the husband of Mary, of whom was born Jesus who is called Christ (ho legomenos Christos). But lest any one should meet us with the question, What should prevent that He whom we call Christ (ton par’ hēmin legomenon Christon), being a man born of men, performed what we call His mighty works by magical art, and by this appeared to be the Son of God? we will now offer proof . . .
And if the phrase was used by Hegesippus, then we have yet another instance of its Christian usage. All this, of course, increases the likelihood that the phrase was something more likely to have been inserted by a Christian into Josephus. “The brother of Jesus called Christ”: another Eusebian footprint in Josephus? There are several reasons for thinking the Jesus reference in Book 18 of Antiquities by Jewish historian Josephus is a forgery (or at least related to a marginal gloss imported into the main text by a copyist), and most would agree that it is at least a partial forgery. Those who think that Josephus made at least some sort of reference to Jesus Christ in Book 18 often turn to Book 20 where there is another reference to Jesus Christ, and conclude that the latter reference supports at least partial authenticity of the former. The question of this Book 20 reference to “the brother of Jesus called Christ” is less clear cut than the one over the better known earlier reference to Jesus in Book 18 of Antiquities discussed in an earlier series of posts. This is partly because of a larger array of possible explanations, although common to them all is the fate of at least three Greek words. This post (two posts) will bring out the pre-Eusebian evidence for this particular phrase, the different contexts of these pre-Eusebian references, and leave the curious to ponder at the end why it was from Eusebius onwards that we have our first witness to the text we all read in Josephus today. In other words, the evidence that exists strongly suggests that it was not known in Book 20 of Antiquities until Eusebius said it was there. The evidence also strongly suggests why Eusebius might have felt a need to scribble a word or two or three (maybe more) into this passage in Book 20. But first things first: Most of what follows is not my own thoughts, but my own distillation of the much more detailed and thought-provoking discussion by Earl Doherty in his The Brother of Jesus, (the One) Called Christ, which is the second part of his article, Josephus on the Rocks. My post is entirely my own take from Doherty’s argument, and should not be seen as a summary of his. He discusses in much more detail many issues I only allude to, and others I do not take up at all — although I believe they are all essential reading for anyone seriously interested in an honest appraisal of this question. Next essential point: Jesus and James were very common names. There is even another Jesus mentioned as the successor to Ananus as high priest after the latter executed James. Question 1. The original Book 18 passage did not (originally) say Jesus was the Christ, so it would be pointless in Book 20 to try to identify Jesus as the one called Christ. Josephus at no point had described any of his many Jesus’s this way before. (Some would argue that Josephus wrote something else in Book 18, such as a hostile remark indicating he was opposed to those who called Jesus the “Christ”. This is mere speculation, however. It should be noted, further, that Josephus never in any other instance of would-be Christs (e.g. those who promised to part the Jordan River, or bring down the walls of Jerusalem) dares to offend Rome or his own conservative views by declaring that anyone referred to them as would-be Christs or Messiahs, even though it seems obvious to us that this is how others must have seen them. If Josephus really referred to Jesus in either Book 20 or 18, then it would mean that of the many who claimed to be, or were known as, Christs, Josephus made an exception for Jesus by informing readers he was known as such. Question 2. Whenever Josephus makes a second reference to a person after there have been quite some “pages” since the first mention, he recapitulates enough detail to remind readers whom he is talking about again. (See Earl Doherty’s article, linked above, for examples initially from Steven Carr.) Why, then, would Josephus not do more to remind readers who this Jesus, brother of James, really was if he had been last mentioned as far back as 2 books earlier? On the other hand, Josephus does sometimes make an obscure sketchy reference to a person leaving readers to wait a few sentences before he clarifies in more detail that person’s identity. It is quite reasonable to think that Josephus might have done the same in this instance in Book 20. Here a few lines after mentioning Jesus, brother of James, he tells us that Jesus, son of Damneus, was made the next high priest (– after the murder of his brother, James?) If it were not for the “called Christ” words, we would assume that the Jesus brother of James reference was pointing to the Jesus who became the high priest after the judicial execution of his brother James. unjustly condemn an innocent man (a brother of Jesus, James by name) to death. These acts roused strong opposition against Ananus and some reported Ananus’s illegal actions immediately to the Roman governor before he had yet arrived, and others reported him to the Jewish King Agrippa. So Ananus was removed from the high priesthood, and replaced by Jesus. And now Caesar, upon hearing the death of Festus, sent Albinus into Judea, as procurator. But the king deprived Joseph of the high priesthood, and bestowed the succession to that dignity on the son of Ananus, who was also himself called Ananus. Now the report goes that this eldest Ananus proved a most fortunate man; for he had five sons who had all performed the office of a high priest to God, and who had himself enjoyed that dignity a long time formerly, which had never happened to any other of our high priests. But this younger Ananus, who, as we have told you already, took the high priesthood, was a bold man in his temper, and very insolent; he was also of the sect of the Sadducees, who are very rigid in judging offenders, above all the rest of the Jews, as we have already observed; when, therefore, Ananus was of this disposition, he thought he had now a proper opportunity [to exercise his authority]. but as for those who seemed the most equitable of the citizens, and such as were the most uneasy at the breach of the laws, they disliked what was done; they also sent to the king [Agrippa], desiring him to send to Ananus that he should act so no more, for that what he had already done was not to be justified; nay, some of them went also to meet Albinus, as he was upon his journey from Alexandria, and informed him that it was not lawful for Ananus to assemble a sanhedrim without his consent. Whereupon Albinus complied with what they said, and wrote in anger to Ananus, and threatened that he would bring him to punishment for what he had done; on which king Agrippa took the high priesthood from him, when he had ruled but three months, and made Jesus, the son of Damneus, high priest. Origen, writing from around the 220’s, is our first “surviving” witness to this phrase. Three times Origen asserts that Josephus wrote that phrase, and that it was used as part of a narrative in which Josephus supposedly declared that many Jews believed Jerusalem and their Temple were destroyed as punishment for the murder of James. That is significant. Origen thrice claimed that Josephus wrote that many Jews (even perhaps Josephus himself) believed their nation was destroyed as punishment for the murder of James, the brother of Jesus called Christ. Twice Origen also speaks of this James as “James the Just”. Yet just as significantly, no such narrative appears in our copies of Josephus. Compare the James passage above. There Josephus merely says that there was a James who, with several companions, was murdered unjustly by the high priest. Nor is there any suggestion that this James was known as “the Just”. And to so great a reputation among the people for righteousness did this James rise, that Flavius Josephus, who wrote the “Antiquities of the Jews” in twenty books, when wishing to exhibit the cause why the people suffered so great misfortunes that even the temple was razed to the ground, said, that these things happened to them in accordance with the wrath of God in consequence of the things which they had dared to do against James the brother of Jesus who is called Christ. And the wonderful thing is, that, though he did not accept Jesus as Christ, he yet gave testimony that the righteousness of James was so great; and he says that the people thought that they had suffered these things because of James. For in the 18th book of his Antiquities of the Jews, Josephus bears witness to John as having been a Baptist, and as promising purification to those who underwent the rite. Now this writer, although not believing in Jesus as the Christ, in seeking after the cause of the fall of Jerusalem and the destruction of the temple, whereas he ought to have said that the conspiracy against Jesus was the cause of these calamities befalling the people, since they put to death Christ, who was a prophet, says nevertheless— being, although against his will, not far from the truth— that these disasters happened to the Jews as a punishment for the death of James the Just, who was a brother of Jesus (called Christ),— the Jews having put him to death, although he was a man most distinguished for his justice. Now in these it is recorded, that “when you shall see Jerusalem compassed about with armies, then shall you know that the desolation thereof is nigh.” But at that time there were no armies around Jerusalem, encompassing and enclosing and besieging it; for the siege began in the reign of Nero, and lasted till the government of Vespasian, whose son Titus destroyed Jerusalem, on account, as Josephus says, of James the Just, the brother of Jesus who was called Christ, but in reality, as the truth makes clear, on account of Jesus Christ the Son of God. There are several reasons for believing that Origen’s passage was definitely not a part of the Josephan Book 20 passage cited earlier and that we find in today’s copy of Josephus. The Josephan passage is about how evil the high priest was and how outraged his Jewish populace were, yet Origen’s story of James the Just being martyred would require that all the Jews fully supported the high priest in the murder of James; also Origen’s story of a Christian James does not make sense in the Josephan passage — why would murdering a despised Christian outrage the Jewish nation? ; and Origen’s James is also renowned for his scrupulous adherence to the law, so on what grounds would Ananias have had him murdered as a law-breaker? Other early Fathers wrote of the same account about James the Just, brother of Jesus, being martyred, and whose martyrdom was the reason for the destruction of Jerusalem and its Temple, but attributed it to Hegessipus. Will maybe complete next post tomorrow . . . .
Notice some comments from way back that included urls did not get through — am belatedly correcting that now. And I simply can’t bring myself to take the time to address his convoluted and frequently fatuous arguments that confuse metaphors with realities to rationalize the need for a spirit man in the sky to actually give his son over to be butchered for us to be forgiven and have a personal relationship with him. Not to mention his tortured assertion that by submitting totally to a book’s precepts we are engaging in a meaningful “two-way” personal relationship with a deity! (I have addressed a little of the damage all this has inflicted on too many in a few of my posts in my Fundamentalism category and in my notes on Marlene Winell’s Leaving the Fold.) His explanations of how faith changes lives is also a non-starter and reminded me of what I discovered when I began to think about my own faith — how faith is a mindgame, a very useful and positive one for many, but not one to judge others over. Also want to finish off my Josephus section with a discussion of the James (brother of Jesus called the Christ) passage in Josephus’ Antiquities 20, but that involves a bit of organization work to prepare and edit. Also I have fallen way behind in collating and editing my years old notes from earlier studies that I would like to revisit and think through again by posting here. — including my notes on Old Testament studies and archaeology. It’s all probably out of date by now and I’ll have to do more catch up reading before I can revisit those. And I’m bemused by the fact that the most hit-on post on my blog (4000 in 9 months) is an incidental notice re the Venus of Willendorf. The literary form of the gospels is too detailed to be legend. Modern fiction . . . contains details and dialogue and reads like an eyewitness account. . . . In ancient times, romances, epics, or legends were high and remote — details were spare and only included if they promoted character development or drove the plot. . . . In modern novels, details are added to create the aura of realism, but that was never the case in ancient fiction. Timothy Keller has clearly never read any (or certainly very very little) ancient fiction from the Greco-Roman period spanning the time of the gospels. Unfortunately my own collection of ancient Greek novels (spanning b.c.e. to c.e.) is back in Australia, but there is still enough translated content online to give anyone interested the ability to assess Keller’s assertion that the gospels, because they include realistic details that do not advance the plot, are unlike any ancient fiction and therefore can only be understood as records of eyewitness testimony. “In modern novels, details are added to create the aura of realism, but that was never the case in ancient fiction”? I submit that a spread out rug and linen sheet in the stern of a ship beats a mere cushion for realistic detail in any age. After running about almost over the city, I caught sight of Giton, as it were a fog, standing at the corner of an alley close to the door of our inn, and hurried to join him. I asked my favorite whether he had got anything ready for our dinner, whereupon the lad sat down on the bed and began wiping away the tears with his thumb. Much disturbed at my favorite’s distress, I demanded what had happened. For a long time I could not drag a word out of him, not indeed till I had added threats to prayers. Then he reluctantly told me. . . . He didn’t just see Giton, he saw him “at the corner of an alley” and “close to the door” and not just any door, but the one “of our inn”. And the two didn’t just begin to speak — that is all the plot would have required, and the character development — but he spoke while he “sat down on the bed”, etc etc etc. . . .
Can this ancient account, so rich in detail that was never the case in ancient fiction (Keller! ), really have no explanation other than being derived from eyewitness testimony? As I fortuned to take my voyage into Thessaly, about certain affairs which I had to do (for there my ancestry by my mothers side inhabits, descended of the line of that most excellent person Plutarch, and of Sextus the Philosopher his Nephew, which is to us a great honour) and after that by much travel and great pain I had passed over the high mountains and slippery valleys, and had ridden through the cloggy fallowed fields; perceiving that my horse did wax somewhat slow, and to the intent likewise that I might repose and strengthen my self (being weary with riding) I lighted off my horse, and wiping the sweat from every part of his body, I unbridled him, and walked him softly in my hand, to the end he might piss, and ease himself of his weariness and travel: and while he went grazing freshly in the field (casting his head sometimes aside, as a token of rejoycing and gladness) I perceived a little before me two companions riding, and so I overtaking them made a third. . . . Riding through slippery valleys, cloggy fallowed fields, wiping the sweat from the horse’s body, letting his horse have a piss, seeing its head shake from side to side. . . .
And Thomas Keller claims in a best selling religious tract that the ancients did not use realistic detail to portray fiction! This, by Keller’s lights, is the truest of all, since it not only recreates an ancient civilization in amazing detail, but is introduced with many assertions that it really is indeed a true story. And the richness of the detail in how the story came to be known by Critias has convinced many even today that the tale really does have a verifiable lineage. It doesn’t, of course. Plato in the same and other books regularly makes up myths to teach his philosophy. Listen then, Socrates, to a tale which, though passing strange, is yet wholly true, as Solon, the wisest of the Seven, once upon a time declared.
. . . but it was the eldest, who, as king, always passed on the scepter to the eldest of his sons, and thus they preserved the sovereignty for many generations; and the wealth they possessed was so immense that the like had never been seen before in any royal house nor will ever easily be seen again; and they were provided with everything of which provision was needed either in the city or throughout the rest of the country. For because of their headship they had a large supply of imports from abroad, and the island itself furnished most of the requirements of daily life,—metals, to begin with, both the hard kind and the fusible kind, which are extracted by mining, and also that kind which is now known only by name but was more than a name then, there being mines of it in many places of the island,—I mean “orichalcum,” which was the most precious of the metals then known, except gold. It brought forth also in abundance all the timbers that a forest provides for the labors of carpenters; and of animals it produced a sufficiency, both of tame and wild. Moreover, it contained a very large stock of elephants; for there was an ample food-supply not only for all the other animals which haunt the marshes and lakes and rivers, or the mountains or the plains, but likewise also for this animal, which of its nature is the largest and most voracious. And in addition to all this, it produced and brought to perfection all those sweet-scented stuffs which the earth produces now, whether made of roots or herbs or trees, or of liquid gums derived from flowers or fruits. The cultivated fruit also, and the dry, which serves us for nutriment, and all the other kinds that we use for our meals—the various species of which are comprehended under the name “vegetables”— and all the produce of trees which affords liquid and solid food and unguents, and the fruit of the orchard-trees, so hard to store, which is grown for the sake of amusement and pleasure, and all the after-dinner fruits that we serve up as welcome remedies for the sufferer from repletion,—all these that hallowed island, as it lay then beneath the sun, produced in marvellous beauty and endless abundance. And thus, receiving from the earth all these products, they furnished forth their temples and royal dwellings, their harbors and their docks, and all the rest of their country, ordering all in the fashion following. First of all they bridged over the circles of sea which surrounded the ancient metropolis, making thereby a road towards and from the royal palace. And they had built the palace at the very beginning where the settlement was first made by their God and their ancestors; and as each king received it from his predecessor, he added to its adornment and did all he could to surpass the king before him, until finally they made of it an abode amazing to behold for the magnitude and beauty of its workmanship. For, beginning at the sea, they bored a channel right through to the outermost circle, which was three plethra in breadth, one hundred feet in depth, and fifty stades in length; and thus they made the entrance to it from the sea like that to a harbor by opening out a mouth large enough for the greatest ships to sail through. Moreover, through the circles of land, which divided those of sea, over against the bridges they opened out a channel leading from circle to circle, large enough to give passage to a single trireme; and this they roofed over above so that the sea-way was subterranean; for the lips of the landcircles were raised a sufficient height above the level of the sea. The greatest of the circles into which a boring was made for the sea was three stades in breadth, and the circle of land next to it was of equal breadth; and of the second pair of circles that of water was two stades in breadth and that of dry land equal again to the preceding one of water; and the circle which ran round the central island itself was of a stade’s breadth. Given the suffeit of detail in the Atlantis account, by Timothy Keller’s claims we have far more reasons to believe Atlantis was a fact than anything in the gospels. Another form of ancient fiction was letter writing, including the creation of collections of letters to form a kind of novel. I have made my notes on Rosenmeyer’s discussion of this ancient fiction available at Ancient Epistolary Fictions on this blog. In this work Patricia Rosenmeyer discusses in detail how budding authors were taught the art of creating realism in their fictional works by the inclusion of incidental and personal details. Keller cites the 153 fish detail in the Gospel of John as reason to believe this gospel is not fiction. Scholar Jo-Ann Brant would disagree. She has written a study demonstrating the novelistic motifs throughout this Gospel. Again I have notes from her work on this blog: Novelistic plot and motifs in the Gospel of John. For the sake of a little irony it is appropriate to round this post off with another passage from Petronius’s Satyricon (ch.13). Here is a narrative incorporating little details that don’t seem to advance the plot or add to character development, but is about a widow weeping over her cadaverized husband in a tomb, with two crucified bodies still hanging outside nearby, and a Roman soldier. In the end the corpse is no longer found in the tomb but back on a cross. So deep was her affliction, neither family nor friends could dissuade her from these austerities and the purpose she had formed of perishing of hunger. Even the Magistrates had to retire worsted after a last but fruitless effort. All mourned as virtually dead already a woman of such singular determination, who had already passed five days without food. A trusty handmaid sat by her mistress’s side, mingling her tears with those of the unhappy woman, and trimming the lamp which stood in the tomb as often as it burned low. . . . Meantime, as it fell out, the Governor of the Province ordered certain robbers to be crucified in close proximity to the vault where the matron sat bewailing the recent loss of her mate. Next night the soldier who was set to guard the crosses to prevent anyone coming and removing the robbers’ bodies to give them burial, saw a light shining among the tombs and heard the widow’s groans. . . . Accordingly he descended into the tomb, where beholding a lovely woman, he was at first confounded, thinking he saw a ghost or some supernatural vision. But presently the spectacle of the husband’s dead body lying there, and the woman’s tear-stained and nail-torn face, everything went to show him the reality, how it was a disconsolate widow unable to resign herself to the death of her helpmate. He proceeded therefore to carry his humble meal into the tomb, and to urge the fair mourner to cease her indulgence in grief so excessive, and to leave off torturing her bosom with unavailing sobs. . . . But the lady, only shocked by this offer of sympathy from a stranger’s lips, began to tear her breast with redoubled vehemence, and dragging out handfuls of her hair, she laid them on her husband’s corpse. Given that this was written in ancient times when, supposedly, “adding little details for realistic effect was unknown”, would the little details here — the number of days without food, the mistress trimming the lamp as it burned low, the particular night in question, the good-looks of the woman, the pulling her hair out and laying it on her husband’s corpse — prove this to be an eyewitness report? Re-reading some of the ancient fiction for this post I was reminded of another classic description of the most fabulous detail and famous throughout so much of antiquity — the description of the shield of Achilles. The details on this shield were popular enough to be emulated by Virgil for Aeneas, and by Apollonius for his cloak of Jason. A partial translation and summary of the details can be read at this Wikipedia article. The answer to the first question is simple. The last statement is nonsense. To ask why a religion would make up a story of their leader being crucified is the same as asking why any religion would want to have a martyr as its founder. All martyrs are by definition falsely blamed and suffer unjust deaths. Not a single reader of Josephus suspects for a second that the 800 Pharisees crucified by King Alexander Jannaeus deserved their fate, and this entirely because of the facts the speaker narrated to explain how it came about that they were so unjustly crucified. Any character created in the shadow of the Old Testament heroes who suffered unjustly would attract the sympathy and praise of audiences. Prophets were martyred. Men of God, such as Joseph in particular, were betrayed by their brethren. This makes them all the more honourable and worthy in the eyes of readers. Nor was the pagan god Dionysus any less popular in the Greek and early Roman times for his cruel and unjust death. There is evidence that Second Temple Judaism included some who came to think Isaac had literally been sacrificed and was raised again from the dead, and that at the time of the Maccabean martyrs many looked to Isaac’s act as embodying both their personal hopes and the hope of Israel. See my post from last year, Could Jews Never Have Imagined a Crucified Messiah?, and related posts, for the details. The mental torment of Jesus counterproductive? Methinks Keller knows the value to be acquired in “making these up” or “reporting them” — I am sure missionaries today are able to avoid confusing their prospective converts in the way Keller says first century folks would be confused. I think many believe, argue, that one of the very reasons for the success of Christianity from the beginning was its ability to preach a God who could identify with humanity’s sufferings, who knew the “weaknesses of the flesh”, “yet without sin”. The fact of the success of Christianity shows that they were not, as Keller suggests, offended in the least, but attracted to the idea just as many moderns are. The success of the gospel story lies in how its hero does not succumb to the pressures of the flesh that torment him. Keller’s objection is a straw man. A famous teacher have dim-witted disciples is a classic literary foil to both exalt the leader and encourage readers that there is hope for them, too. Buddha had the like, so did Apollonius of Tyana, and Elisha, and Moses. . . How many Christians don’t love Peter for his failings despite his intentions? The appeal of the disciples is universal. It has been the same from the beginning. Matthew, Luke and John, and many would also include Mark too, acknowledge that the gospels are not as pessimistic about the disciples at all, but are stories that demonstrate how they came to emerge as leading witnesses and pillars despite their earlier faililngs. Again Timothy Keller’s argument is a straw man. Timothy Keller seems to be arguing that a story that works for people today would not have worked for people of yesterday. But it obviously did work for it to be still here, with the same appeal as ever.